Derek Rich | Featured Team Member | Cox Automotive Inc.
Derek Rich is a content developer for the Cox Automotive product design and usability group with an amazing superhero side gig. By day, Derek Rich is a content developer for the Cox Automotive product design and usability group. But then he quietly slips out the door, makes a superhero transformation and emerges as Superman to visit sick kids in local children’s hospitals with the Cosplay Volunteers of Atlanta organization. 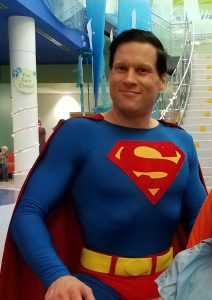 This superhero side gig keeps him busy, with visits to Children’s Healthcare of Atlanta campuses, including Scottish Rite and Egleston, and an occasional road trip to Palmetto Children’s Hospital in South Carolina. Team member Derek Rich as Superman! But it’s the kids’ reactions that keep the Man of Steel coming back. It’s probably not a surprise that the original 1978 Superman movie starring the late Christopher Reeve and Margot Kidder, is his favorite superhero movie. “They just got it right,” he explained.